The Cosmic Pets Collapsible Pet Carrier, for dogs or cats. Perfect for travel or round the house. Comfortable, soft & secure. The Cosmic Pets Collapsible Pet Carrier, for dogs or cats. Perfect for travel, pet shows or round the house. Comfortable, soft & secure. Traveling with your pet is a breeze when you use a Cosmic Pets crate or carrier. The Cosmic Pets Collapsible Pet Carrier is easy to move and assemble, allowing pet owners to leave large, clunky crates behind. Flexible and space-saving, soft crates are the perfect solution for pet owners and breeders. Cosmic Pets offers a range that is lightweight, durable and can be set up and folded down in seconds, no tools needed. 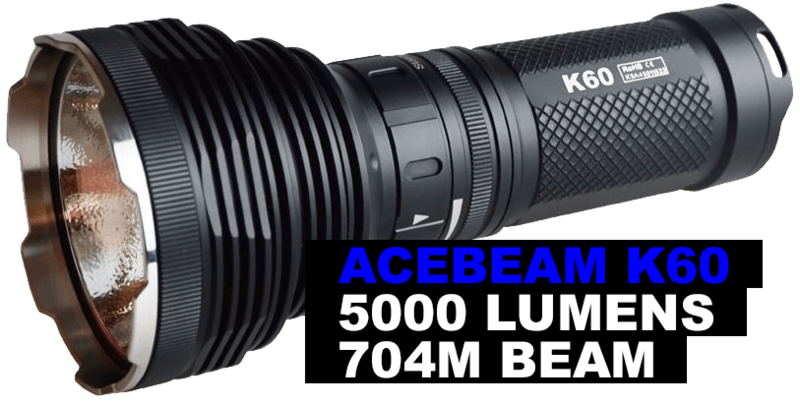 When not in use it folds down to 7cm for easy compact storage. 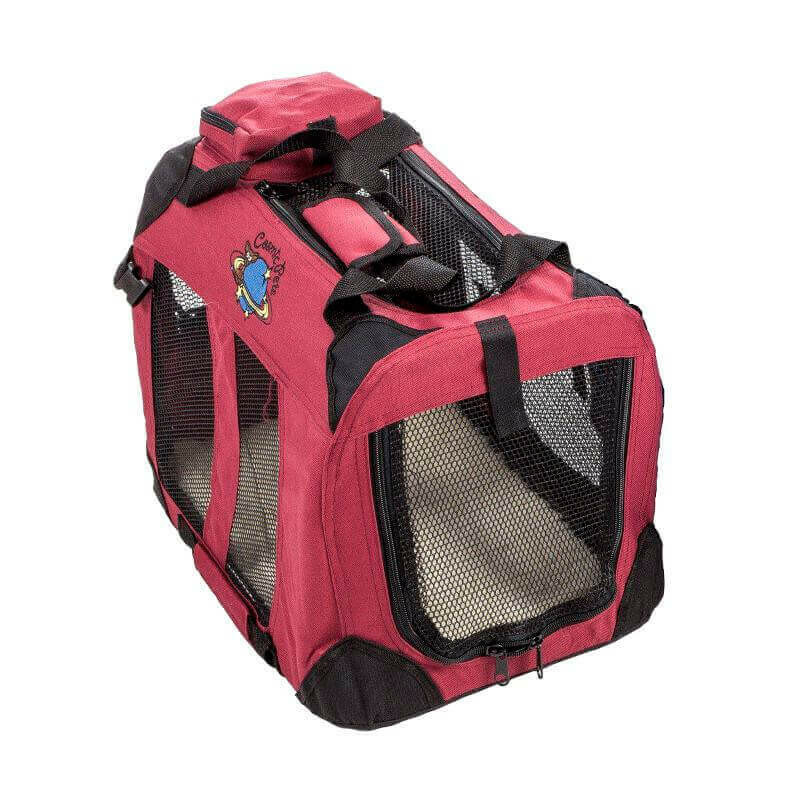 The top zippered mesh opening also makes accessing your pet so much more convenient when you need to give a treat or a little cuddle without the risk of them dashing out the carrier. If your pet is required to spend extended periods of time confined, the mesh panels ensuring plenty of air circulation and prevents your pet from overheating. For your dog, dogs are naturally den animals and value their own special spot, which a dog crate can provide while also doubling as a pet bed, or indoor kennel. Cosmic Pets Collapsible Pet Carrier can provide dogs with a private spot and are multi-purpose for use as an indoor enclosed kennel or dog bed. A dedicated, safe and comfortable space for your pup will also give your pet a sense of privacy and security as well as help to keep them off the furniture, lessen the build-up of dirt, hair, and dander in the house. The indoor kennel should be placed where your pup can still observe and be part of the family. To ensure that your dog feels a part of things, place your crate in a busy area of the home where they can see and hear what’s happening. 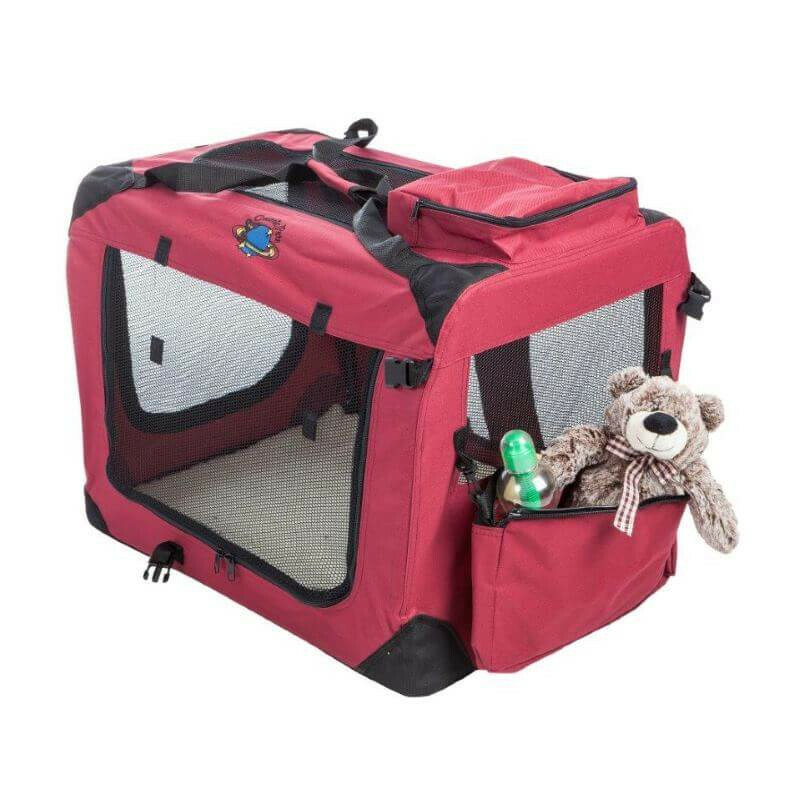 A corner of the family room, or in the kitchen are all ideal places for your Cosmic Pets Collapsible Pet Carrier. Traveling with your cat; a trip to the veterinary surgery, moving to a new house or traveling anywhere with your cat can be a daunting experience. A few simple considerations can make the whole process more tolerable for cats and owners alike. It’s important to get a cat carrier that is designed specifically for transporting pets – making use of a laundry basket or pillow case is not safe and may injure or traumatize your cat. A cat carrier, like Cosmic Pets Collapsible Pet Carrier, with multiple access doors works best. Look for a cat carrier that can be opened from the top, side and front – these are specially designed to reduce stress for pet and owner when traveling. An ideal carrier or crate for Pet Shows. Traveling with your pet is easy when attending the next pet show, when you use Cosmic Pets Collapsible Pet Carrier! The Cosmic Pets range is well represented at pet shows and a favourite with the show and breeder community – offering a pet house that is comfortable and mobile but also solid and spacious. During dog or cat shows your pet is required to spend extended periods of time confined in their show crate. The mesh panels ensure that your pet has plenty of circulating air preventing your pet from overheating. The top zippered mesh opening also enables you to access your pet during shows without the risk of them dashing out the carrier and into the crowd. Dogs: Measure the distance from the top of the nose to the root of the tail and from the ground to the highest point of the dog. The carrier should be big enough for your pet to stand comfortably and turn around. Cats: The carrier should be one and a half times the size of your cat, with enough room to stand up and turn around.